The 2017 DC Design House is here! And this year, it is conveniently located in my backyard (well, almost my backyard!). This stately 27,256 square-foot residence is tucked away on Congressional Court in Potomac, MD. Whether this will be your first time attending a DC Design House or you haven’t missed one yet, here are ten reasons to visit this year! Have you ever wondered what it would be like to have a movie theatre in your own home? How about a two-story library complete with a spiral staircase? The 2017 DC Design House has a little something for everyone! Wander from room to room and take it all in. The designer spaces are numbered so that you move through the house in an orderly flow. Located in Area 2 (to the right as you walk in the front doors), you are greeted by a Living Room designed by Margery Wedderburn Interiors. The room includes this fantastic sculpture by Desire Obtain Cherish. All I could think about was how much my toddler would love this! And how much I want this in my living room! How can you not smile when looking at a sculpture of giant pink melting lollipop? If you are a fan of the color blue, you will not be disappointed! There are some amazing “Wow” moments for this bright and bold color. Located in Area 7, The Study Royale is a cheerful and sophisticated space by Lorna Gross Interior Design. If you follow my blog, you already know how much I love letting vibrant blue hues pop against a neutral palette (check out my dining room!). From the original artwork to the fantastic plush lounge chairs, this room is a blue paradise. This wall at the 2017 DC Design House was a show-stopper for me! Located in Area 8, the Lady’s Retreat by Marika Meyers Interiors featured 12 individually framed Hermes scarves for a high impact, graphic display. I love the surprise element of framing textiles instead of a photograph or a print. The bright colors and unique designs on the scarves are grounded by the uniformity of the white, sleek frame and grid arrangement. Simply stunning! Okay, this topic is actually going to be my numbers 5 through 7. That is how awesome the artwork in The Collector’s Cabinet is. Designed by Josh Hildreth Interiors, this showroom features two standout works by Danish fine art photographer, Trine Sondergaard. Measuring 60.5 x 60.5 in., these pieces will immediately grab your attention and then, they will quietly hold it. Are these portraits or mesmerizing still-lifes? I admit it! I had to do a double take! There are a lot of tantalizing visuals in The Collector’s Cabinet by Josh Hildreth Interiors and so, I forgive my mind for not picking up on this fabulous detail immediately. I mentally registered “plaster busts” while my eyes kept moving through the room, taking it all in. Was I expecting to see pies splattered across their faces?! No way! Stephen Antonson’s Pie Thomas and Pie George add a touch of irreverent humor to this elegant and thoughtful space. By the time I saw the John Baldessari framed print, Stonehenge (With Two Persons) Orange, I started noticing a theme of hidden faces in The Collector’s Cabinet by Josh Hildreth Interiors. 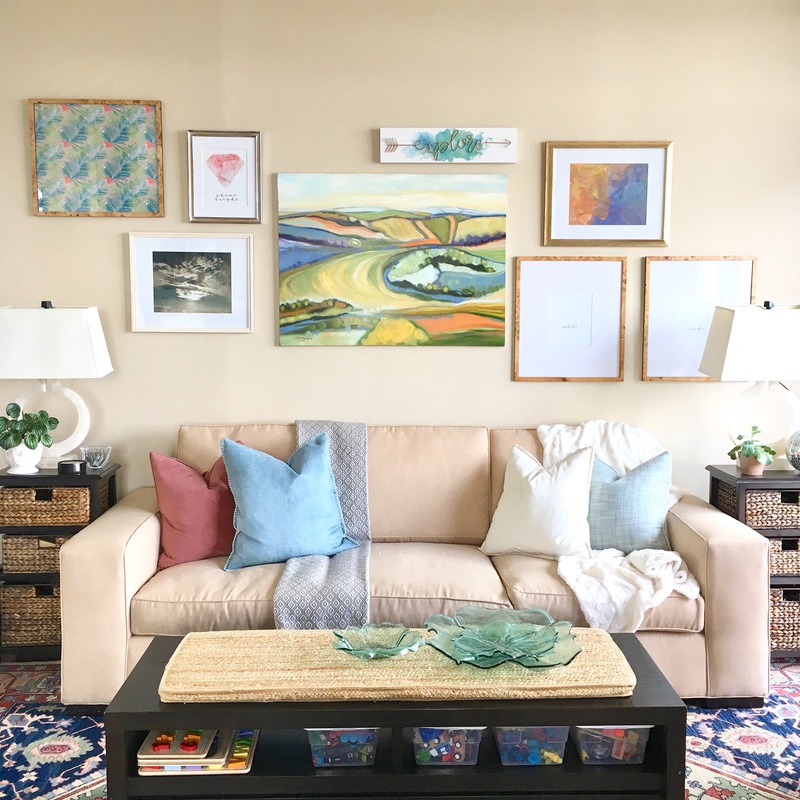 Bright, graphic, and thought provoking, this smaller artwork packs an unexpected punch in one of the corners of this room! Located in Area 12, The Upstairs Family Room, by Erica Burns Interiors features a series of pressed botanicals by Sweet Grass Botanicals. Displayed behind glass, the shapes of the leaves are bold and visually interesting. They also add earthy tones and natural texture to this interior space. By walking down the back staircase, you reach Area 17, The Lounge, which showcases a pair of Louis XVI style chairs with no cushioning or fabric. Stripped to their wooden frames, furniture becomes high art. They resonate like ghostly statues, mysterious and reminiscent of another time. The Lounge, by Perceptions Interiors, sets these chairs against dark painted walls that have architectural details completely outlined in chalk! You read that right…all of those lines are drawn by hand, in chalk!! Area 22, the last space you walk through before exiting, highlights that the 2017 DC Design House benefits Children’s National Health System in Washington D.C. The walls feature beautiful installations of paintings by the patients, caregivers, staff, and volunteers of Children’s National Health System through its Art Therapy program. This year, the theme for the artwork is The Very Busy Life of Little Bees. So there you have it! Ten reasons to visit the 2017 DC Design House which will run through October 29! I would love to hear what stood out for you! Did you have a favorite showroom? A “wow” moment? Let me know! Bethesda Row Arts Festival – Part 1: What is an arts festival exactly and why should I go? I thought the wall of scarves was incredible. Who would have thought that something every woman has a million of could have such an impact ? Such creativity, the framing and the grid pattern totally elevated 12 individual scarves, each beautiful on its own, to 1 huge, fabulous and riveting art piece that moves the viewer to take in the whole room. Beautifully done, just shows you how framing and the imaginative exhibition of a piece can enhance a whole room. I completely agree! I love the idea of taking something that you already own and reimagining it as an art piece. The Hermes scarves installation illustrates what a powerful tool framing can be. Furthermore, anyone can recreate this look with their own beautiful textiles. What a great way to display treasures from an exotic vacation or family heirlooms that have been passed down from one generation to the next!